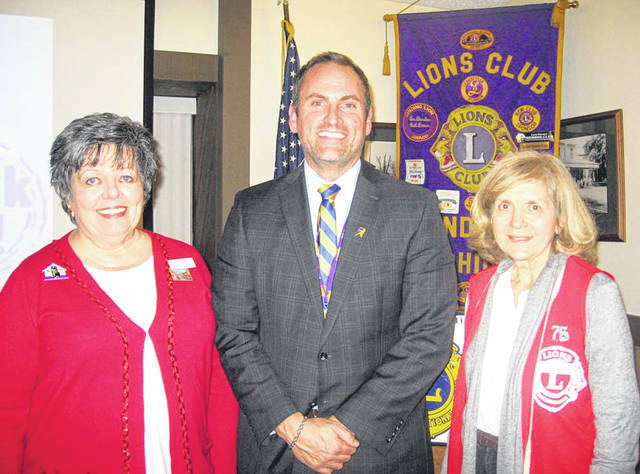 Lion President Sharon Rose (left) stands with Vandalia-Butler City Schools Superintendent Robert O’Leary, and Lions Program Chairperson Dee Smith. VANDALIA — Robert O’Leary, Superintendent of the Vandalia-Butler City Schools, spoke at the November 8 dinner meeting of the Vandalia Lions Club. His topic was “State of the Schools,” which covered numerous statistics related to academics and planning, including facilities and busing. There are 3,098 students in the District including pre-school; 26 buses amassing over 300,000 miles per year; Senior Class of 2018 receiving over $7 million in College Scholarships, which ranked third in the ounty in college enrollment and degree attainment; support of non-degree career planning including military; and starting in the third grade, emphasis on positive behavior. The continuing five-year Strategic Plan covers 43 elements addressing Academic Excellence (including the STEM Subjects-Science, Technology, Engineering & Math), development and retention of high-quality staff, Honoring Community Partnerships, forming an Alumni Association, and promoting local control of state-provided funding including fewer strings attached. Mr. O’Leary has been with Vandalia-Butler Schools for 15 years, starting at Murlin Heights Elementary as a fourth grade teacher and serving as an Elementary Principal on his way to being District Superintendent.